Oklahoma authorities say that the sheriff’s deputy who fatally shot an unarmed man trying to evade arrest was reaching for his Taser but accidentally pulled his firearm, NBC News reports. 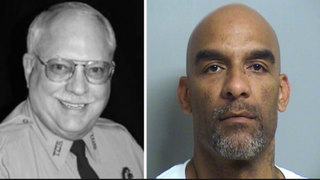 Body-camera video from the April 2 encounter shows Eric Harris, 44, of Tulsa running as Reserve Deputy Robert Bates, 73, can be heard yelling “Taser! Taser!” before firing the fatal shot during a chase. Several officers try to put Harris’ arms behind his back, with one officer appearing to put his knee on Harris’ head. “He shot me! He shot me, man. Oh, my God. I'm losing my breath,” Harris says as he squirms on the ground. “I shot him! I'm sorry!” one of the officers, presumably Bates, can be heard saying on the video. Harris died at a local hospital an hour later, and prosecutors are reviewing the incident. “The case has been turned over to the Tulsa County district attorney and autopsy results are pending,” Tulsa County Sheriff’s Maj. Shannon Clark said at a news conference, according to NBC News. Warning: Video contains graphic material.